Immediately after The Jackson 5 were signed to Motown Records, Bobby Taylor (who had a group at Motown called Bobby Taylor & The Vancouvers) began working with the group cutting tracks and teaching them songs. He was not only the one who got the group an audition at Motown but he was the first professional they worked with in the recording studio. Bobby wanted to record the boys in the tradition of soul. “I started cutting tracks like a madman,” said Bobby, “right there in the studio on West Grand. Ray Charles tunes, Clyde McPhatter, The Isley Brothers, you name it.” The rhythm section included Motown’s unsung Funk Brothers ensemble of musicians including James Jamerson on bass, Earl Van Dyke on keyboard and Joe Messina on guitar. “We must have recorded thirty or forty tunes before the first record came out,” Bobby said. However, the rhythm sections of their songs were laid down at the Hitsville Studio before the group recorded their vocals in Los Angeles. In the beginning, Bobby worked exclusively with the group in the recording studio. He wanted the whole concept of their first album to be etched in soul, not lightweight pop. However, it was said that Gordy felt that he was cutting tunes on the group that sounded a bit old fashioned. “I was turning the Jackson 5 into a classic soul act,” Bobby told writer David Ritz. “Berry wanted Michael to do more bubble gum material.” Eventually, Bobby and Berry were not seeing eye to eye and he was eventually let go. To finish producing the tracks on the Jackson 5’s album, Gordy brought in a team of producers he called The Corporation that consisted of Deke Richards, Fonce Mizell, Freddie Perren, Hal Davis and Gordy himself. The majority of the cuts on the album were indeed entrenched in deep soul, under the helm of Bobby Taylor. The arrangement on the opening cut, the Disney tune “Zip A Dee Doo Dah,” was very funky which featured Michael opening the tune with a highly exuberant “yeah yeah yeah” shrill reminiscent of the opening of Sly & The Family Stone’s’ “Sing A Simple Song.” The other cuts were the likewise soulful and funky “Nobody,” covers of the Four Tops “Standing In The Shadows of Love,” the Temptations “I Know I’m Losing You” and Sly & The Family Stone’s “Stand.” It was the music of Sly & The Family Stone that would be a big influence on the Jackson 5’s early music. The Corporation would study the melodies and singing arrangements of Sly and his band and incorporate what they learned into the Jackson 5’s early music. One of the most impressive tunes was their bluesy and soulful remake of the Miracles song “Who’s Loving You.” Michael’s take on the lead vocals impressed the song’s original writer himself, Smokey Robinson. Michael sang the song as he lived each and every lyric of it. Also a standout was the ballad “Can You Remember.” This was reminiscent of something an older group like The Delfonics or Chi-Lites would have done, but Michael’s lead vocals, along with his brothers’ bright harmony and the tight lushly instrumentation, were fabulous. Then of course was the cut that would become the Jackson 5’s first single at Motown, “I Want You Back,” which was originally titled “I Want to Be Free” and was slated for Gladys Knight & The Pips. However, the song was given to The Jackson 5 and, under Gordy’s instruction, was revamped with a Frankie Lymon treatment. From the piano riff opening, to the wah wah and bass guitars and the group’s high spirited vocals, “I Want You Back” was pure magic. It was released as a single a few months ahead of the album on Oct. 7, 1969 and would eventually become the group’s first number one hit on both the Soul and Pop charts. 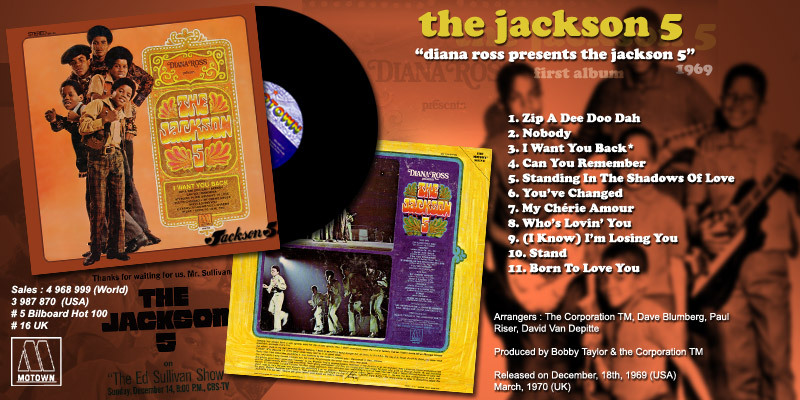 The album, entitled “Diana Ross Presents The Jackson 5”, was so titled because being that Diana Ross was a huge star (who was about to leave her group The Supremes), Berry Gordy felt that her name being attached to the group would help them become popular. 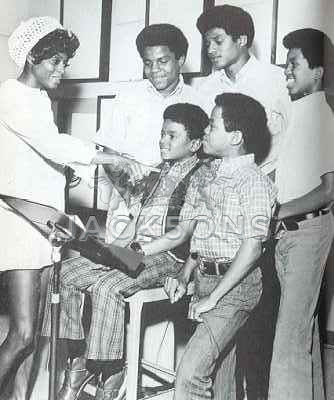 Indeed, in August 1969, the group performed at a discotheque called the Daisy in Hollywood Hills where Diana Ross would first offically introduce them. On the back cover of their first album are photos from that event, including one which showcased Michael and Diana Ross center stage at the microphone. The back cover also included liner notes written by Diana. “Everything about these guys says honesty to me,” Diana wrote. “Whether they’re singing Smokey Robinson or the Beatles or an old standard, they exhibit an inborn professionalism and an innate honesty which says everything.” She even cited that Bobby Taylor was the first professional to work with them. Early pressings of the album listed Bobby Taylor and The Corporation as producers. However, later pressings would only list The Corporation as producers. 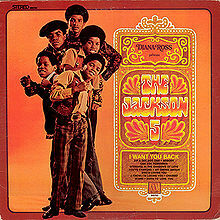 The album’s front cover featured a photo of the Jackson 5 standing together in unison as Michael and Marlon smiled and held up their hands in black solidarity clenched fists. “Diana Ross Presents The Jackson 5” eventually went to number one on the Soul charts in February 1970 for nine weeks and number five on the Pop charts the same month. The Jackson 5 captured the hearts and minds of the record buying public and would continue so for many years to come. The Jackson 5 were on their way.